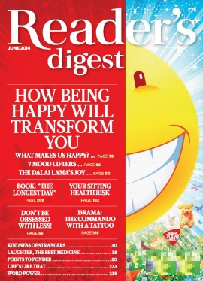 We have received our subscriber’s copy of Reader’s Digest – India Edition – May 2014 Issue quite on time. 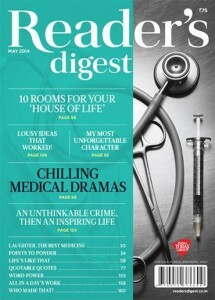 It is a milestone issue of RD in terms of designing (as they introduce a new design this month. This design they have revealed in their official FaceBook page along with the design changes took place in the history of the magazine since it’s beginning. The editorial is thoughtful where the editor recalls two people who influenced him the most in addition to discuss some key stuff of the issue and new design. The case of the peeping photographer – article is something a lot of people may relate themselves with. It is about a photographer’s action to take photographs of his neighbors and print/publish it. The verdict of the court is also found at the end of the article and the author asks the reader’s their views. We expect extreme answers to be found in reader’s reaction section in next couple of issues in the same regards. By the way, now a days it is easier to take photographs using the mobile phones anytime and anywhere. So it is the responsibility of the photographer to draw the boundary for himself. The remaining photographs are available for public viewing at: http://arnesvenson.com/theneighbors.html; you can check and judge yourself and think whether they violate someone’s privacy. Dr. Dayal’s article about various phobias is worth a read. Ruskin Bond – a famous storyteller is getting 80 this month. We are delighted to see a face-to-face with him in this issue of RD. You shouldn’t miss reading it (the interview) – specifically the answer to the last question. Falling for Maths is an interesting read, the article could have been more detailed and inspirational for people to not to shy from Maths. 5 Lessons People Learn Too Late – is taken from the Psychology Today, and if human mind and habits is what you are interested in exploring, it is a good read. The article advise some good habits also, so you can read it for that too. The article about Genetically Modified Foods is however written for all but will found interesting by those who are looking towards the food in scientific manner (or from the pure health vision). Chilling Medical Dramas – brings factual information about four strange incidents which rather we may not like to believe. An interesting read. See the World differently brings interesting pictures and information about a beach, you will like it. As Mother’s Day is approaching, there is an article containing two stories which are emotional and good at literary context also. 10 rooms that should be in the house of life – is a philosophical and kind of art of living article. The description for each room could have been longer and if added with one interesting example for each case, it could have been more effective. Mr. Popular Science – is a tribute article by editor Mohan Sivanand to his first editor. The article is well written and focused on intelligence, vision and human side of Mr. Jha. The article will give you a clear vision that what qualities of a person creates a benchmark. The silver lining – is a good article, what we like the most is the tagline of the article. As we often try finding happiness in material stuff, it is quite important to look at the fact mentioned (in the tagline). You should read it. Lousy Ideas… that worked! – is something you may read for passing time. Unthinkable Crime, then an inspiring life – is a good article. It is inspirational and focused on positive attitude and human attributes. If you like to read adventure dramas – discovery on the trail – will interest you. A small article about fly swatter and information about a competition of using it introduce you to the rather funny side of the world. The issue misses some good book reviews. 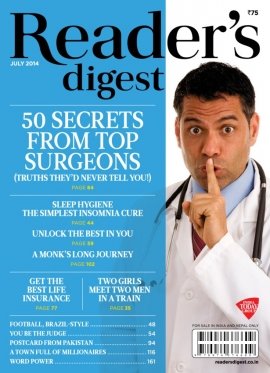 Overall a balanced issue which returns the value of your time and money you spent to read it. It is good way to beat the heat.